White Diamonds Elizabeth Taylor, one of the most celebrated and successful fragrance franchises of all time, unveiled the launch of the newest intrepretation of the iconic collection – Love & White Diamonds, during an enchanting evening at the Academy Mansion in New York City on October 17th. The evening honored two of Elizabeth Taylor’s greatest loves of her life, her passion for romance and love affair with diamonds. In attendance to co-host the event was Actress and Filmmaker Camilla Belle, who emobodies the elegant glamour, passionate heart, and joyous spirit of Elizabeth Taylor. One of the key inspirations of Love & White Diamonds is the epic love of Elizabeth Taylor and Richard Burton, an endless romance that captured the imagination of the world. Their expression of fiery passion for one another is recreated through a bouquet of beautiful floral notes in the magical and glamourous fragrance. Elizabeth Taylor’s fragrance empire extends beyond the scents themselves; it encompasses this sense of worldly love she had for others. In the same year she launched White Diamonds, she established The Elizabeth Taylor AIDS Foundation, dedicated to supporting people affected by HIV and AIDS around the world. 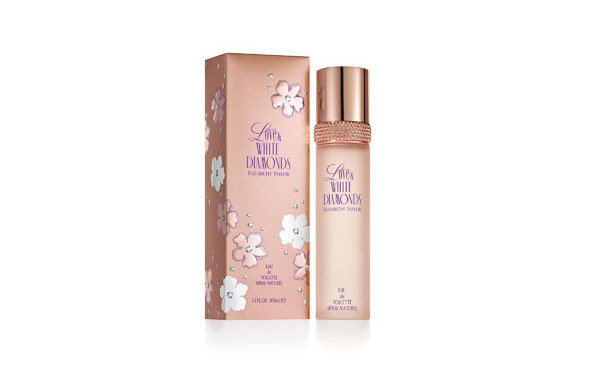 As part of Elizabeth Taylor’s passionate commitment and fearless leadership in this cause, she directed that a portion of her royalties from White Diamonds and her other House of Taylor fragrances go to The Elizabeth Taylor AIDS Foundation.